The Nursery | One Room Challenge Week Four — Stevie Storck Design Co. 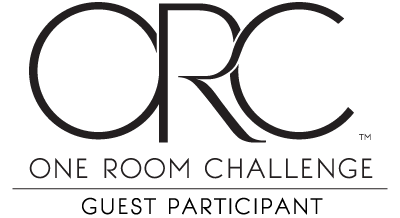 It's week four of the One Room Challenge and while it doesn't feel like I made a lot of progress this week, I did spend a lot of time working on the practical/functional aspects of the room. Here's a rundown of what we did this week! But first, if you're just joining in now - Hi! I'm Stevie, an interior designer, thrift store regular, kind of outdoorsy wife and soon-to-be mama! My husband, Anthony and I are slowly renovating our 1903 fixer upper in York County, Pennsylvania. You can see more of our house right here and my last three ORC posts here: Week One | Week Two | Week Three. 1. Skubb Box, set of 6 - I got 4 of these in black. Two for organizing the nursery dresser and one for each of our nightstands in the master bedroom. 2. Sanela Cushion Cover - I'm loving this mustardy yellow in the nursery. It's a warm accent color that contrasts both the green-gray of the walls and the burgundy background of the vintage Karastan rug. In fact, this exact color is in the pattern of the rug so for $8 this velvet pillow cover was definitely going in my cart! 3. Antilop High Chair - This obviously won't live in the nursery, but we decided to go with the famous $20 IKEA high chair because it seems like everyone who has it loves it! I have heard that the tray is hard to remove, so I'm considering ordering this removable placemat for easier clean up. On Saturday, I washed all the 0-3 month baby clothes so I could put them away with our new organizers! You can tell I'm nesting because I went full Kon-Mari with the folding. 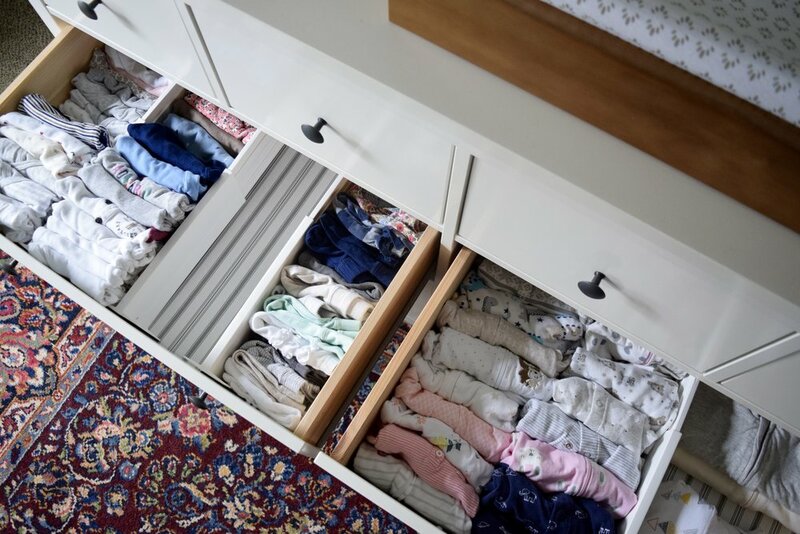 I am fully aware that these drawers will never look like this again but it was important to me to separate out the few newborn size items we have so I remember to use them before she grows out of them! I used these drawer dividers for the wide drawers and the IKEA boxes to divide up the small top drawers. Since our dresser is from IKEA, they were a perfect fit! In other news, we also got a rocker for the room! It's not the glider I had on my original mood board. From the reviews it seems like that one sits pretty low and I was worried about it being comfortable for two taller people like me and Anthony. With time running out before reveal day - and my due date - I convinced Anthony we should buy this old rocker off of Facebook Marketplace, even if it's just as a placeholder until we find something new. It's obviously a bit dated, a little darker than what I wanted and I'd rather not have two button tufted upholstery items in the same room. But for $30, it was well worth the peace of mind for me having a something to rock our little girl in when she gets here and we were actually both surprised by how comfortable it is. So we may or may not end up replacing it, but for now it's just perfect! If you watched my room tour on Instastories this week (it's saved to my "nursery" highlight!) you know that aside from the gallery wall above the dresser, deciding on art and wall decor for rest of the room has been a bit of a challenge for me. I think I finally decided to go with a couple shelves by the rocker - as seen in the mockup below - and probably a mirror over the settee. I like the idea that the mirror would reflect the mural on the opposite wall, instead of another piece of art competing with it. I'm thinking it has to be round or oval otherwise it would be too many rectangles with it hanging between two windows. We'll see what I find! With just two weeks left in the challenge, we still have a lot of work to do. Here's hoping for a productive weekend! As always, you can see the week four updates from the 20 featured bloggers below or and the rest of the guest participants here. Thanks for following along!